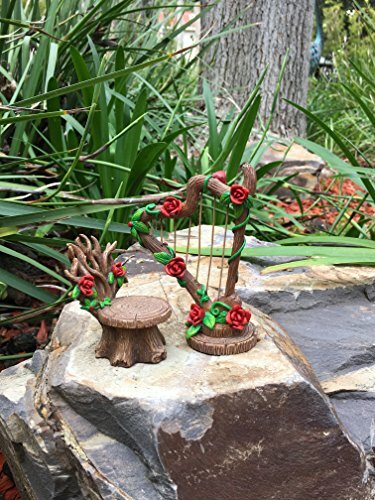 The Miniature Rose Harp and Chair set is a must-have for any miniature garden! It is an elegant, beautiful miniature furniture set adorned with red roses and wrapped with green vines and leaves. 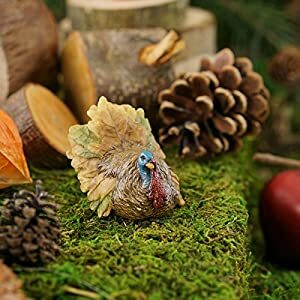 Detailed wood engravings are carved throughout this miniature fairy garden set which makes this a completely unique one-of-a-kind piece! Fairies fall in love with set on first sight! 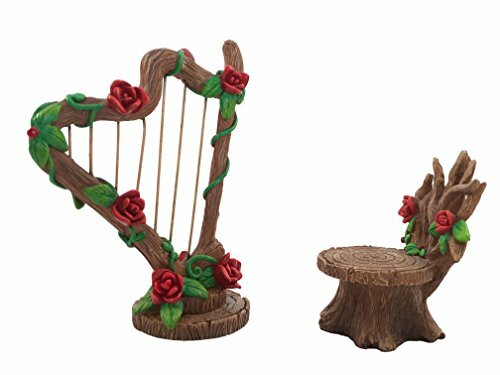 The Miniature Rose Harp and Chair set is a beautiful miniature furniture for the fairy figurines. The set is adorned with red roses and wrapped with green vines and leaves. 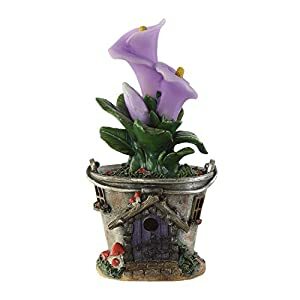 Detailed engravings are carved throughout this miniature fairy garden set which makes this a completely unique one-of-a-kind piece! 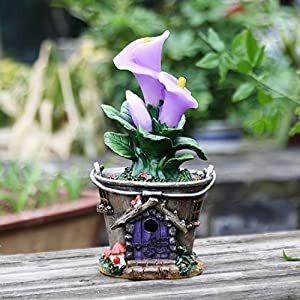 Miniature fairies fall in love with the set on first sight! 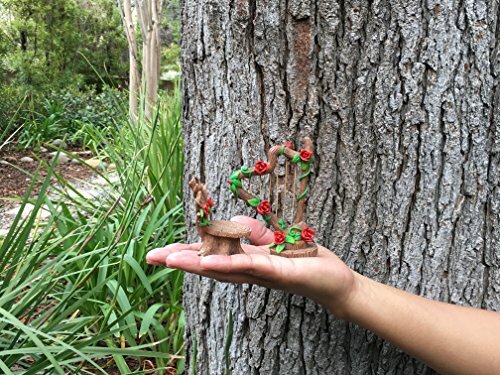 The chair has roses and leaves on the back rest and constructed of twig like material. The matching harp is absolutely gorgeous decorated with roses, leaves and wrapping green vines. 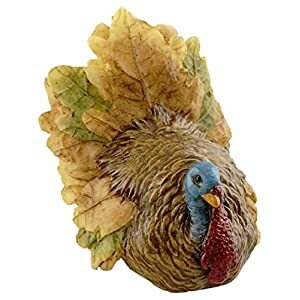 This set is very detailed and lovely as can be! 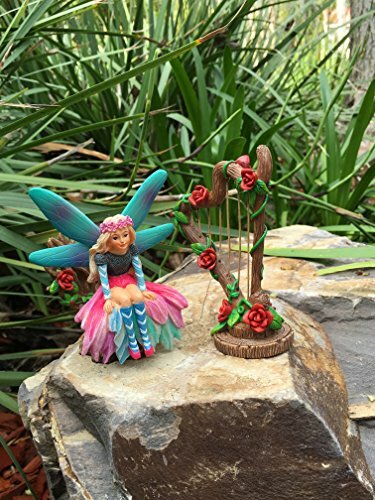 You will find many fairies playing on this instrument attracting the gnomes and magical creatures in Fairyland. 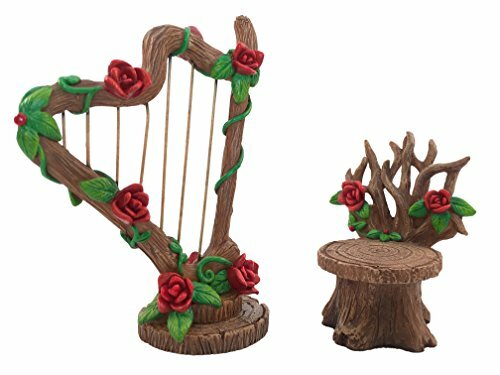 The harp and chair set is a must have in your fairy or gnome miniature garden! 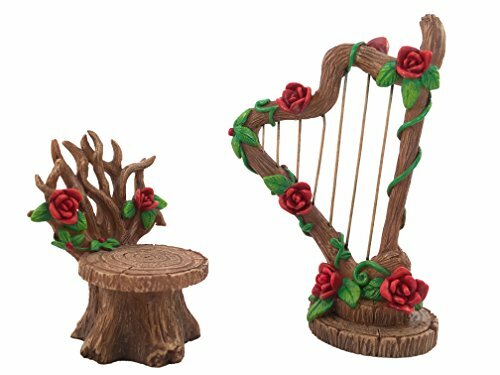 The miniature musical furniture set is designed for outdoor / indoor / patio and lawn décor and can withstand all the elements of mother nature as is casted in high quality resin and hand painted with care by our artists.